The ODFW Hunter Education Program coordinates hunter safety classes. The goal of OHA is to advocate for wildlife, wildlife habitat, and hunter's rights in the state of Oregon. Klamath County is blessed with an abundance of deer and elk. Those herds are tiny compared to the numbers of migrating geese and ducks who use the county as a vital stopover. The Klamath Basin, which sits directly under the Pacific Flyway, is also home to vast populations of waterfowl. Local hunters and fly fishermen proudly state that there are few places on the planet as rich with wildlife as Klamath County. Record trout populate the rivers feeding Upper Klamath Lake. 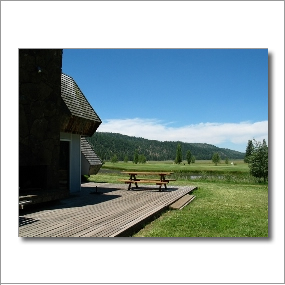 Round Lake Resort is situated among horse and cattle ranches just outside Klamath Falls, Oregon. Round Lake is also a full service RV Park and has its own beautiful 9-hole, Par 30 golf course. Round Lake Resort provides a terrific getaway destination and base to ecxplore the many hunting and fishing opportunities in the Klamath Falls area. Experience the tranquility of the Round Lake Community in Oregon. Plan your visit to Klamath Falls. Klamath Falls Motels and Hotels. A guide to Oregon's only National Park, Crater Lake.